Hello and welcome to the New Year! Depending one which Religion/Cult/Ancient Society you follow, this year could well be the end of the world! Things to look forward to if your British or a huge sports fan is the 2012 London Olympics! Yey! Or if your cynical, to remark at how much money we have spent when we are in an economic crises! Take your pick. Well for my first review of the year I thought I would go for a little change. Bar my first, my reviews have been Rizzoli and Isles and Women’s Murder Club based. I fancied a different book saga this time and so my favourite non crime saga came to mind. 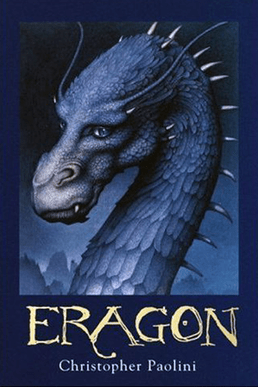 “Eragon” by Christopher Paolini. Now. Yes it is a teen fiction book but no more than Harry Potter or Twilight are one either. Though in my defence I was a teen when I read the first one. Paolini was just 16 when he wrote the first novel and was published and although the fact his parents own a publishing company does take the edge of this great achievement, it still is an achievement. Just because it is easier to be published does not mean you have a good book. It can just mean that your absolute drivel of a book is now in print (a bit like this blog!) Luckily, it isn’t drivel. If you like Lord of the Rings, Harry Potter and any other magical, mystical, mythical type books then this is the one for you. The main character is Eragon, a nobody from the back-end of no where with no prospects. However, he is happy. He is carefree and his greatest ambition is to be a good farmer to help his uncle. He doesn’t know who is father is and his mother is somewhat unknown, bar the fact she is the sister of his uncle. His pride in life is his tracking and hunting skills. Eragon is the only one from his village brave and confident in his abilities to dare travel into the Spine. A group of mountains feared even by the evil king. It is this that starts our young hero’s adventure. While in the Spine, a blue rock flies from the sky and lands in front of Eragon. He of course takes this back and tries to exchange it for meat at the loathsome butchers. In time, this rock hatches and a blue Dragon emerges from within. Due to the Dragon hatching for Eragon, a bond is formed so ancient, it calls into question the title of the Ancient Egyptians. Of course, a Dragon hatching is not easy to keep quite, especially as there were only three known dragon eggs in existence before Saphira (the dragon) hatched. This leads to the destruction of Eragon’s childhood home and the brutal murder of his beloved Uncle. 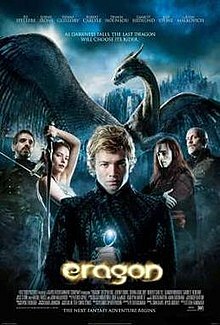 An epic quest begins for Eragon to avenge his uncle’s death, free the common people from the evil king and ultimately fulfill his new destiny of becoming a Dragon Rider. As you can see, my plot section was not as long as usual as I would have actually written the book out for you if I had carried on. It can easily be titled as an epic. 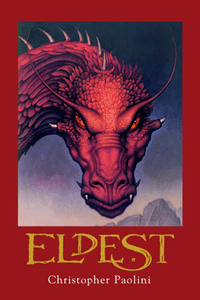 Paolini creates new lands, languages and races and through Eragon, you learn them effortlessly. Maps and dictionaries are provided and they stay updated to Eragon’s knowledge. As Eragon is as in tune with his own land as we are, this means you can keep up with the history, culture and power struggles quite well. You learn as he learns. Yes, many people feel that Paolini relied rather heavily on The Lord of the Rings for his characters. There are Elves, with an Elf Queen, Dwarves, Urgals, Humans and Magicians, plus many tribes within these and these characters wouldn’t stand out within the Tolkien Trilogy. However, I have read the Lord of the Rings and can without a shadow of doubt exclaim that Paolini surpasses him. Maybe it is because of the language Tolkien is using (though as I loved the Hobbit by Tolkien it seems doubtful) but I found the Lord of the Rings very long winded and many chapters to be pointless as they neither moved the story on nor developed the characters. Paolini does use Tolkien’s structure of following two different character arcs that ultimately end up joining up at the end, but he does so with real purpose. Maybe the odd chapter or two could have been culled but out of four books, each spanning between 600-1000 pages, it isn’t really noticeable. Eragon is someone you can relate to. Paolini chooses a human to follow in this quest smartly. Humans we can understand. Their emotions, behaviour and flaws are all reconisable and make it easier to follow. Things which baffle Eragon about other races and cultures baffle us as a reader and makes you feel that you are not alone. Eragon is not a perfect person nor does he do good all the time, but he strives to do good, and although he has to internally battle some decisions, he generally makes the correct one (but how many people here could say we don’t have to don armour with ourselves to decide on the correct course?). The interaction between Eragon and Saphira is golden and the chemistry between the two leaps of the page. If this was a TV series, one could compare it to the F.R.I.E.N.D.S. series chemistry. Saphira becomes our dragon too and genuinely makes you wish dragons existed just so you could have a chance of becoming a Dragon Rider (I’m not gonna lie, I have had dreams where I was chosen, not Eragon! ).